(AP) -- Pale but smiling, an international crew of researchers on Friday walked out of a set of windowless modules after a grueling 520-day simulation of a flight to Mars. The all-male crew of three Russians, a Frenchman, an Italian-Colombian and a Chinese slowly emerged from the western Moscow facility, which simulated the confinement, stress and fatigue of interplanetary travel - minus the weightlessness. Dressed in blue track suits emblazoned with the mission emblem, they carefully walked down a metal ladder to a greeting crowd of officials and journalists. "The crew has completed the experiment," team leader Alexey Sitev reported to Russian space officials. "The mission is accomplished, the crew is in good health and is ready for new missions." Psychologists said long confinement without daylight and fresh air put the team members under stress as they grow increasingly tired of each other's company. They said that psychological conditions can even be more challenging on a mock mission than a real flight because the crew won't experience any of the euphoria or dangers of actual space travel. Despite that, the crew showed no sign of stress as they walked to microphones to speak before cameras. "We hope that we can help in designing the future missions to Mars," Frenchman Romain Charles said with a smile. His Italian-Colombian crewmate Diego Urbina said the crew felt proud to achieve the longest-ever imitation of space flight, so that "humankind can one day greet a new dawn on the surface of distant but reachable planet." The facility at Moscow's Institute for Medical and Biological Problems, Russia's premiere space medicine center, includes living compartments the size of a bus, connected with several other similarly-sized modules for experiments and exercise. During the experiment, the crew communicated with the organizers and their families via the Internet, which was delayed and occasionally disrupted to imitate the effects of space travel. They ate canned food similar to that offered on the International Space Station. 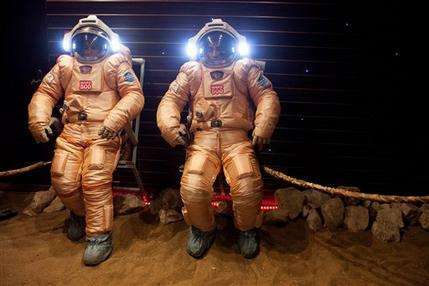 Midway through the mission, the crew even conducted a mock Mars landing, venturing from their cramped quarters in heavy space suits to trudge into a sand-covered room and plant flags of Russia, China and the European Space Agency on a simulated Red Planet. They also took "samples" from the ground and conducted faux scientific experiments. The organizers said each crew member will be paid about $100,000, except the Chinese researcher whose reward hasn't been revealed by Chinese officials. The crew will spend three days in quarantine to minimize the risk of infection before holding a press conference. Sitev, who led the team into the quarters just a few weeks after getting married, said he dreams about going to the seaside. "I want to go somewhere to the warm sea as we have missed two summers here," he said in remarks carried by RIA Novosti news agency shortly before wrapping up the mission. "My thoughts are drifting toward swimming at sea and basking on warm sand." Urbina told RIA Novosti that he would also like to have a vacation in the Caribbean and would spend the money he earned on a sports car and a pilot training course. The organizers said they had considered some female candidates for the experiment, but left them out for various reasons. They denied that they deliberately had formed an all-man crew because of the failure of a similar simulation in the past. The 1999-2000 experiment ended in acrimony after a Canadian woman complained of being forcibly kissed by a Russian team captain following a fist fight between two Russian crew members that left blood splattered on the walls. Russian officials downplayed the incidents, attributing them to cultural gaps and stress. A real flight to Mars is decades away because of huge costs and massive technological challenges, particularly the task of creating a compact and relatively lightweight shield that will protect the crew from deadly space radiation. NASA is aiming for a nearby asteroid around 2025 and then on to Mars in the 2030s. Vitaly Davydov, a deputy head of the Russian space agency, said the experiment completed Friday will help pave the way for a real Mars mission. He added that it's not expected until mid-2030s and should be done in close international cooperation. A real flight does not have to be decades away. A plan has been in place for years (Mars-Direct) that does not rely on creating a huge "Death Star" type of infrastructure. Too bad they could'nt run the experiment in a space station. I don't think you want to have guys cooped up in a space station for that long just so you can test whether you _can_ keep guys cooped up for that long. Woopee! My goodness, what a tough ordeal. For the information of the scientists who set this up; there have been prisoners in solitary confinement and other people locked away for years more, without other comnpanions, without the internet, etc,. etc,. and undergoing torture and worse. These people had no lack of gravity to affect their bones, had no exposure to radiation storms from the sun, had people to interface with, and medical on call if necessary, and on and on and on. Gosh, how could they stand such rigourous treatment? As far as I can see, they had a nice vacation with books and other entertainments and they got paid hamsomely for laying around and basically doing nothinig except make-work for a year and a half. Pardon me for not being impressed. For the information of the scientists who set this up; there have been prisoners in solitary confinement ... undergoing torture and worse." For *your* information, disingenuousness doesn't win any points. The prisoners, torturees, etc. (you only need one "etc.") were not undergoing psychologic testing *voluntarily*. "Mars Direct"-type missions would have centrifugal 'gravity'. With proper shielding, which we already know how to build, a real mission would be safe too. With appropriate time delays in the signals, remember, to simulate *not* having close human contact. The "real" explorers must indeed risk being without doctors--unless the team includes one. Not entirely nice; there was the boredom problem. they got paid hamsomely for laying around and basically doing nothinig except make-work for a year and a half. This was basic research, not "make-work." It may sound gross, but did they have the space toilet or a normal flush one? showers or sponge baths for all those 520 days? They should have had the same system used on the ISS for the "journey" to the Red planet,and then on "arrival" they could enjoy a regular gravity operated toilet,as Mars has gravity,although not as strong as earth. Now that's true representation of current space travel! I wonder if you can flush a toilet on Mars..? You might want to keep the plunger handy.The gravity on Mars is 38% that of earth's gravity. I wonder if you should...water being a pretty precious commodity there by all accounts.